So let’s start with what I have chosen to use with our new site re-design and then move through some of the other themes we’ve used as well for our professional photo blog. This is the theme that I’m using for our new website redesign. It pretty much rocks my world. There’s a visual editor instead of just pages of code for putting your site together. So you simply drag and drop boxes (called leafs) on your page wherever you want them while you’re looking at your page. Very cool. Want three boxes across the bottom with content? No problem. Drag and drop the 3 leafs where you want them. Want to change the color of the text? You can do it in the visual editor and see it change on your screen in front of you in live time. Very cool. Edited to add: The Excerpts Plus leaf also allows you to do a grid layout for your blog posts if you want to do something a little bit different, and you can customize each excerpt in a plethora of ways. Super-powerful. It also allows you to filter what is shown by category, so you can set it to only show wedding or portrait posts on a specific page if you want to. You can also customize every page to be different. So if you want your pricing page to look different than your about me page (different layout, different text, really anything) you can do it. You can also have a different background and header image, so if you offer both portraits and weddings and want to have two sites or blogs that are branded differently but aren’t actually two different sites, this allows you to do it pretty easily. You can also have 2 separate blogs with content that is filtered by categories, so you could have one wedding blog and one portrait blog showing on your site very easily. It’s super easy to incorporate using all of Google’s free web fonts on your website without any extra plugins. With two simple lines of coding that you can copy and paste, you can even get it to show up in your visual editor and not have to do any major custom coding to use it. I think a custom font makes a huge difference in having beautiful design. It also ties in with Yoast’s WordPress SEO plugin that I highly recommend. The visual editor is a bit quirky. Sometimes you have to hit publish twice before it takes hold. Hopefully they’ll fix this in a future release. The Gallery+ leaf add-on is NOT a good gallery option for professional photographers. It’s geared more towards people who want gimmicky transitions instead of a beautiful gallery. They claim you should use this if you need lots of photo galleries (such as for a portfolio) but I actually suggest avoiding it all together. I plan to use a NextGen gallery plugin instead. They’ve made some recent updates that make me like this a LOT better, and it is now what I am using for my galleries. Because the visual editor is so different from what I’ve used in the past, it took me a bit to figure it out. If you’re just starting out, it’d probably be fine. You don’t need to know any css coding to use Headway, but you will want to be familiar with how to add a bit of simple html (such as links and images) to your site to put in the boxes where you want stuff. The easy way to find the code you need is to create a blog post with the link or image you want in it on the Visual tab, then click the HTML tab and copy the code you see into the leaf that you want it to show up. That being said, I do use a bit of css to do some custom styling, but very, very little. I pretty much find all of my coding help at Headway Hub, a site with lots of info on how to customize stuff. My favorite is how to convert a photoshop image into a website. This is pretty much what I did to create my site and get the styling I wanted. Right now a one-time fee of $87 will allow you to buy a copy of Headway that you can use on up to 2 different sites and gives you full access to their support forums and free upgrades for life. As soon as Headway 3.0 is rolled out (sounds like it could be out any day now) they will be increasing the price and moving to a subscription-based fee, so I highly suggest picking it up now before 3.0 rolls out so you can be grandfathered in. I think it’s a steal at this price and is an excellent choice for photographers. I’d buy it now if you’re even remotely interested before the subscription model kicks in. 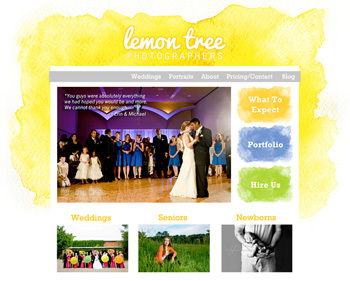 This is by far the most commonly used blog theme by photographers. I’ve used this on my current site, and it’s another great option for your site. It’s super-easy to customize using their back-end and they give you lots of different options. No coding is necessary at all. This is why it is so very popular. There’s an easy uploader built in for quick uploading of images. Saves a lot of time, but there are other image uploader plugins that let you do this as well. Their customer service is out of this world awesome. They are responsive and have given me custom snippets of code for free really quickly when I wanted to do something I couldn’t. I can spot a Pro Photo Blog theme the moment I open up a website that’s using it. SO many people are using it that it’s hard to look unique even though you can use your own branding with it. You are limited with your customizations. While it’s a great base and they do offer a lot, if you want to have a page like mine above with content boxes across a page instead of just simple columns, I’d need to find someone to code it for me. It’s just not quite as flexible. You have to pay to remove the link in the footer to their site. Lame. It’s clunky to load. Because there’s so much code in the background, it seems to load a lot slower than other photo themes I’ve used. It’s not terrible, but it’s something to keep in mind as your Google rankings are affected by page load speed. Absolutely none. It’s very easy to use if you are happy with their customization options. This license allows you to use it on 2 different sites. You can get $10 off by using ProPhoto discount code JAMSWA556, but that’s still a big price commitment. You also have to pay for each upgrade, which is generally about half the price. So it is definitely a more expensive option. I decided to move away from this simply because it wasn’t as flexible as Headway, it was hard to look different from other photographers, and because the upgrade cost is pretty expensive over time. But if you’ve got money to spare and don’t care much about complete flexibility and customization it’s definitely the easiest to set up. I wasn’t going to review this theme because it’s been a few years since I used it, but I thought I’d throw it out there anyways just a bit more watered down. Let me know in the comments what has changed and I’ll update this accordingly. Thanks! This was the first blog theme I used because they have a free option. They do sell a more advanced option for $50, but I haven’t used this so I can’t review it. You should be able to find the differences between the free and paid versions listed on the website. It’s free! That’s pretty sweet. When I used it, there was pretty much no support offered for it, and it required using a lot of CSS coding to edit it, so I didn’t really customize it much at all. It was a bit overwhelming. You need to be comfortable with changing the CSS code, but the amount you need to know depends on how much you want to customize it. This may be different with a newer version if a backend was added, but you’ll have to look into the details more to find out. Read an updated version of this post! What theme do you use? What do you like and dislike about it? Leave a comment below and let us know!